Enrolling your kid for a swimming camp would be the best way to keep your kid occupied during the hot summer days. Swimming is a way to keep your kid cool while encouraging a healthy level of physical and social activity. It provides an effective workout for most of the body parts. Swimming also has a positive effect on the mental and emotional health of the child. It has proven to improve overall mood and help combat depression. • Swimming lessons have the potential to increase intelligence, concentration, alertness, and perceptual abilities. • Your kid eventually becomes extremely peaceful and relaxed. • A study suggests that children aged 3, 4 and 5 years who have started swimming in an early age says that young children who participate in early-years swimming achieve a wide range of skills earlier than the normal population. Swimming also calls in for risk when kids are concerned. Here are a few safety measures which can be taken to avoid mishaps at the pool. • Never leave your kid unsupervised near a pool. • Do not allow a young child in the pool without an adult. 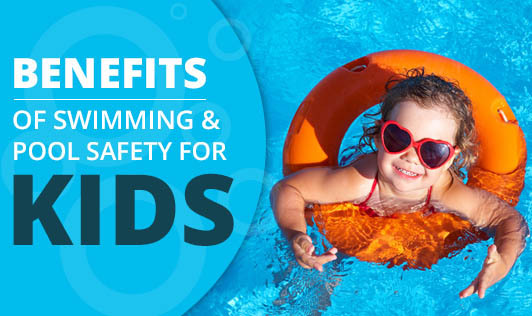 • Because your kid has had swimming lessons, it does not mean he is drown-proof. Kids must be watched closely when in the pool. • Do not use floatation device as a substitute for supervision. • Keep rescue equipment by the pool. Be sure a telephone is provided at the poolside with emergency numbers posted nearby. • If it's a residential swimming pool, then install a fence or a wall at least 4 feet high. If the house is a part of the barrier, then doors leading to the pool should be protected with an alarm. • In-the-water pool alarm that will alert you if anyone jumps or falls in the pool is beneficial if you have a backyard or residential swimming pool. • Babysitters and other caretakers, such as grandparents and older siblings, should also know the basics of CPR (cardiopulmonary resuscitation). • Toys may attract your kids to the pool so remove them from in and around the pool when not in use. • If the pool is above the ground, then all ladders or steps leading to the pool should be secured and locked. • Allow diving only from the diving board and not from the sides of the pool. • Do not allow your kid to push, pull or run around the pool area. • Make sure that your kid swims in the depth that's safe for him. • Make sure that your kid does not chew a gum or eat while he is in the pool. It may choke him. Barriers provide protection to kids who stray from supervision and give additional time for parents to locate their kids. Supervision is the key to avoid the unexpected to become a reality.